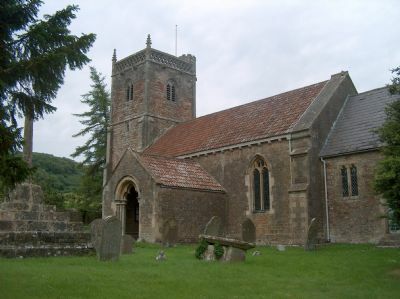 This church was dedicated by Bishop Jocelin on 13th July 1236 and legal documents show that Compton Church was given to Wells Cathedral in or before 1228. The south doorway and the font were however made for a church at least a century older, evidence of more than 800 years of worship in this beautiful, peaceful place. THE NAVE has a beautiful 14th century Perpendicular carved stone pulpit which is said to be one of the best in Somerset. In the centre of the nave is the CHURCHWARDEN'S OAK CHEST which at one time contained a slot into which money for the poor could be dropped. THE FONT is Norman and probably the oldest object in the church.